Shaped by volcanic stone and glacial ice, Iceland is wrapped in an arm of the Gulf Stream that brings a surprisingly moderate climate to this island that touches the Arctic Circle. Iceland's landscape is quite open, forests are few and they're cherished and protected. On an overcast day clouds move up and down valleys and fjords, and in this vast and open landscape you can watch the immense spaces and varied landscape being washed with Northern light and shadows. The land changes constantly with the light and in June and July, when it doesn't get dark- daylight itself becomes a powerful presence. Volcanic energy heats homes, the warm water community swimming pools and back-country hot springs. With hot water available by drilling a hole, Iceland's cities and towns have large number of swimming pools, indoors and out, which are widely used year round. Much of the population of Iceland, especially those who live in and around the capitol city of Reykjavik enjoys hot water and space heat that is exclusively geothermal. Iceland's people are shaped by the land, and most of them aren't more than a generation off the farms where turf houses were common until a couple decades ago. Icelanders have to speak three languages before they graduate from high school: their own Icelandic language, which resembles medieval Norwegian, English (which kids perfect by watching American TV), and Danish (from the country they broke free from in 1943). Many speak other Scandinavian languages or German. Iceland enjoys universal literacy, and a rich literary and poetic tradition. The Icelandic language is both foreign and familiar. It's strong ties to English and other Germanic languages gives some words a familiar sound. ( If someone hollers "Lockith!" at you while you're holding open a corral gate you know just what is expected.) But it also has retained its ancient structure - with noun and verb declensions that confuse natives, as well as foreigners. The Icelandic horse isn't the only thing to be shaped by the country's isolation - the Icelandic Sagas, describing the Vikings and their settling of the land, were written in the twelfth century and they are clearly intelligible to modern Icelanders. 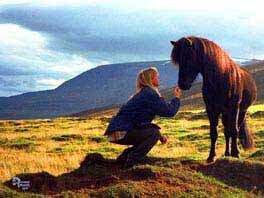 And while the land seen on a horse tour may be wild and primitive, the Icelandic people are as sophisticated as any. With the highest per capita use of cell phones and internet usage and e-mail, Icelanders are very connected to the rest of the world. Reykjavik is small but has its very European shops, clubs and museums, lots of fashionable haunts, hot political discussions, and people who know a lot about the larger world off the rock. You may choose a cross country horse tour that gets you into some pretty primitive landscapes that doesn't leave much room for pampering, but travel to and around Iceland doesn't lack anything. Nearly all our tour prices include airfare on Icelandair, from the east coast of the United States. Icelandair has one of the youngest fleets in international travel, using Keflavik airport as their hub. They are very good airline to fly, with a helpful cabin staff, good food and the European attitude that air travel should be a cut above bus travel. Domestic travel in Iceland is also European in quality. Air connections link many small towns together, and without railroads (topography very much precludes them), Icelanders tend to fly a lot. Bus service is very far reaching and a good choice for internal travel if you have the time and want to see the landscape. The buses are large, smooth-riding, and always offer a scenic ride on your way to your destination. A driving tour of Iceland is also a treat, one that offers a chance to sample some of the off-beat roads and stop at whim.-although Driving in the interior requires 4 wheel drive. Roads are well marked, maps readily available, and Icelanders have a very good sense of the geography of their country and a willingness to help, so asking for directions always gets you to the next destination. Iceland is a country that invites exploration and adventure.. Hikers, bikers, bird watchers, and anglers are drawn to the mountains, and valleys, highlands and coasts. Rich and varied bird life abounds - from little Puffins and Murrelets to huge Gyrfalcons and Skuas. Some of the best salmon and trout fishing in the world is found in Iceland's countless streams. Whether its nightclubs or midnight sun, geology or discography, fishing or fashion, Iceland has something to that nearly everyone can enjoy - in addition to their horses, of course.